Update: May 2015. We are now well in to the construction of the Low H road system in this development. And have had numerous complaints from cyclists who have to use this busy junction, difficult at its best. And, it seems, it may well be at its worst at the moment. We contacted Tfl about the problems many people were experiencing and the reply was, shall we say, less than concerned, in our opinion. And didn’t even arrive until we contacted Len Duvall with our concern at the lack of response. So, at our last meeting in May, we formed a small committee of members who will take this issue, TfL’s safety provision during the roadworks, or lack of it, forward. Their first job will be to get the Tfl officer in charge of the works to meet with us. Below is the history of our involvement and attempts to get the planners to make the new junction safe for all. Towards the end of 2013 some of us viewed the latest plans of the so called Low H road design which had been reviewed to include space for cycling. We listened to what the planners, Tfl, and the developer’s had to say. Space for cycling has different meanings, depending on who you are it seems… in the planning for Lewisham Gateway context it now amounted to a few lead in cycle lanes to ASL’s at multi lane junctions. No protected space, at all. A shared space path through the central development itself was agreed, but we came away with very mixed feelings about it, indeed. We put up a short post here at the time, back in October. We did not post details about the proposals because we were hoping that our comments would be reviewed and taken on board and were waiting for a final response before asking what the wider community of Lewisham Cyclists felt. There was no real consideration at all back then given to how cyclists would move through that junction… the central area of development had plenty of provision for pedestrians walking through, but none for cyclists. The long planning and consultation process since then has coincided with a growth in cycling in London and a growing, if still grudging, awareness that cycling must be considered as a transport option when planning major junctions. However, instead of revising the road system properly and redesigning it with this in mind, the solution offered was to “tack on” a few lead in lanes to ASL’s at the new signalised junctions. Every time we suggested the use of protected space, or the use of semi segregation, we were told, no. Not possible. 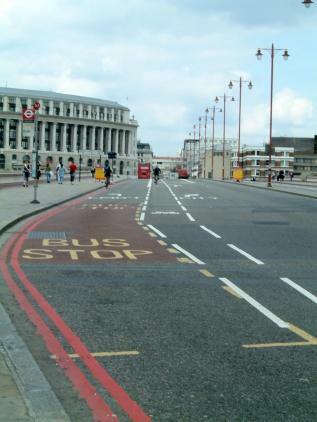 The one area where a full cycle lane had been marked out was alongside the buses only area, and looked alarmingly like the provision on Blackfriars Bridge put in around a decade ago where Vicky McCreery was killed in 2004, by a bus moving out into that area. Given the large numbers of buses that would be passing through at this point, we did not feel this was safe as it could not be a mandatory protected lane. There were also lead in lanes to ASL’s marked on the left at the signalised junctions. At the junction of Rennel and Molesworth St, there were three lanes of traffic marked heading towards Molesworth St with the middle lane being for traffic turning both left and right… we felt this posed particular problems for cyclists approaching this junction, who may well be heading right to get on to Loampit Vale. The question of positioning at busy junctions is crucial for cyclists and having the middle lane full of motor traffic turning left or right with a lead in lane right over on the left to an ASL, makes adopting a safe position for a right turning cyclist so much more difficult and dangerous. “Thank you for your further correspondence dated 12 November, which follows up on the meeting of 24 October. Please accept my apologies for the delay in responding to you. As was explained at the meeting, the Development is constrained due to the two rivers, railway infrastructure and the shopping centre as well as having to accommodate two major roads. Since planning approval was given in 2008, there has been a significant shift towards providing facilities for cyclists as a much higher priority when designing a highway scheme. In response to this shift, the Developer has been working with TfL and LBL to rebalance the priorities within the permissions set out in the Planning Approval. These changes were discussed when at the meeting in October. The current highway layout, including the Northern Lewisham roundabout, creates a substantial barrier to cycling for both local and commuter journeys. The proposed road layout removes this uncontrolled junction and replaces it with three signalised junctions to create the required development area. The road alignment and junctions are therefore an intrinsic part of the scheme and necessary to deliver the regeneration benefits. In order to provide routes which can be used by cyclists with a wide range of experience, a two level strategy has been adopted in the design. · An off-road provision using segregated cycle lanes and shared footways supported by toucan crossings gives cyclists a safer route to, from and through the development. Movement between the on-road and off-road routes is provided for by dropped kerbs within the Gateway development. 1) Molesworth Street southbound bus lane. The proposed cycle lane on the far-side of Molesworth Street southbound bus lane was proposed to highlight the presence of cyclists and make bus drivers aware of how their bus stopping manoeuvres in this area could conflict with cyclists. The concern is that this feature directs cyclists into an area which may not be safer and so the cycle lane markings that currently sit within the bus lane extents will be removed. 2) Waterlink Way near Jerrard Street. The route of Waterlink Way across the proposed bus stand entrance will be reviewed with the aim to improve the layout of this crossing point. This has also been raised with Cycle Super Highways for further review should their route come along Thurston Road. 3) Rennell Street central crossing. Together with item 4 below, this would provide an off-road link from Waterlink Way (southern side) into the development. The suitability of making the central crossing and the footway on each side shared footway will be investigated. 4) Molesworth Street staggered Pelican crossing. The feasibility of this option will be reviewed as it is dependent on there being sufficient space to widen the Molesworth Street crossing, ensuring that the footway is wide enough and providing a safe route for cyclists over the car park entrance. 5) Lewisham Road / Lewisham Hill roundabout. Planning permissions restrict the length of good vehicles permitted to use the Building C service yard to 10 metres. The access has banned right turns into and out of the service yard to protect the operation of the local highway network, but as a consequence there is a need to provide a mini-roundabout at the junction of Lewisham Road with Lewisham Hill to facilitate U-turning movements. The geometry of this roundabout is designed to safely accommodate u-turning movements by 10 metre rigid goods vehicles so cannot be made any smaller. However, during detailed design the deflection of the approach roads will be reviewed to ensure that it is designed to reduce traffic speeds. 6) Loampit Vale Pelican crossing. The use of this crossing to provide a route between the Waterlink Way and the development is not possible due to their being insufficient space to widen the footway on the northern side under the railway bridge. This suggestion therefore cannot be accommodated. Subject to the Developers agreement, items 1-5 will be incorporated into the scheme design with the aim of providing a feasible solution that gives an appropriate balance between road users and the Developers overall budget for the highway scheme. Hopefully this provides sufficient mitigation to ease any remaining concerns related to cycling through and within the Gateway development. The Developer will keep you updated on progress and will arrange to meet with you again during the detailed design process to ensure you can provide input to the details of the cycle provision. So, there will be provision for cyclists. But limited. Which we feel is a waste of an opportunity. An opportunity which doesn’t come along often in London. The chance to re-design a major junction from scratch, giving pedestrians and cyclists the attention and space they deserve, enough space, care and attention to persuade more of Lewisham’s residents to walk and cycle. Sadly, we do not believe that this new design will encourage significant numbers of people to choose a more sustainable form of transport in the future, even though it may well be easier to negotiate on foot or bike than the old roundabout. We intend to continue asking questions about it. Such as, why was it never included on the list of major junctions for review, neither on the original list of 100 difficult junctions, nor it seems will it be on the revised list of thirty three drawn up by the Mayor and his team. Given its strategic importance, we find that odd. We note the final sentences in the reply from TfL that they will continue to consult us on the cycling provision within the development as it moves towards implementation. That is welcome, and we will keep continue to update everyone here. However, the plan itself now seems well on its way to implementation. Looks like we will just have to wait, see and hope. The link to the letter in the 6th paragraph is not working.